The Journey of life which start with our born and end with our death. The time between our born to death is called our Life’s journey. In that meantime, we’re learning a lot of things, so our life is fully filled with joys, celebrations, failures, difficulties and special moments/memories which we will never forget. According to Oliver Goldsmith (an Irish novelist, playwright, and poet), Life is a journey that must be traveled no matter how bad the roads and accommodations. Never give too much importance to money because money will not solve your all real life problems. With money can buy new home, car and some creature comfort, but you cannot buy happiness, friendship, your satisfaction, etc. Always spend some time for yourself and for your hobby. Do the things which you like most because It will give you more strength and positivity to live. It is not necessarily that your all plans will success in your life because sometimes you don’t get your desired result, so don’t worry about it and re-start it with patience. Always learn from the failures of yourself and others. You should always try your best to get your destiny and make your dreams come true. Just Keep in mind – Life is too short. Time will never wait for you so give the importance of time in your life. You should not depend fully on others because sometimes they may make you alone, so always think, you are only your best friend and love yourself because you never cheat yourself. 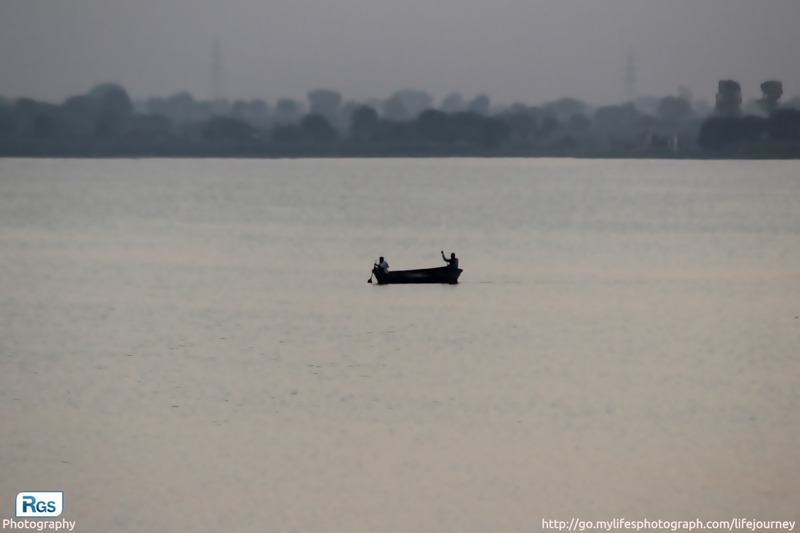 I have captured the fisherman’s photo at Nyari Dam, Rajkot in the late evening. The life of fishermen is very hard, adventurous, and encourageable. The life journey of them is very interesting and inspiring. One message from their life to us is that “To achieve something in your life, you have to wait for the right time and don’t hopeless until you will achieve your goal.“. This photo is captured by using Canon 1200D with 55-250mm lens..
Good one re! Brilliant work! This is really good! And I like how you added in quotes that are relevant and insightful as well. Great life lessons my brother ???? It’s a way beautiful article. We should learn lessons from it. It’s a Journey of life which start with our born and end with our death, after all. Thanks for such a amazing work. Very nice and deep message within it…! I like your creativity and the photography too. Money is no one solution in our personal life. You have beautiful pictures and the thought you have put into the story is inspiring and just as beautiful! Keep your passion alive and you will continue to blossom! Thanks for reading and writing. Your word really matters for me. Beautiful pic and nice lines. It’s my pleasure. Thank you for your kind words.